In a shocking incident, two cousins were killed after being hit by a speeding truck on Gill Road last night. The victims have been identified as 25-year-old Kamal Verma and 21-year-old Amit Verma, residents of New Aman Nagar and Gobind Nagar in the Shimlapuri area. Kamal’s sister Indu’s wedding was scheduled for Friday. Parveen Kumar, elder brother of Amit, said the duo was purchasing cloth material for Indu’s wedding. Two youths were killed with the two-wheeler they were riding collided head-on with a car on the Ludhiana-Ferozepur highway on Thursday night. A class VII student of a private school was seriously injured when the gate of a private eye hospital fell on him during an eye check-up camp organised in the hospital. 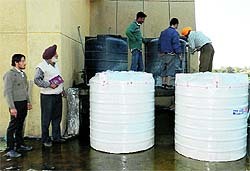 The cash-strapped Ludhiana Municipal Corporation may not have funds to clear the dues of contractors carrying out development works in the city, but it is spending lakhs on the fuel that their official cars consume. The Ludhiana Municipal Corporation has accused the management of a religious place in Sarabha Nagar of encroaching upon a portion of Guru Nanak Public School Road. 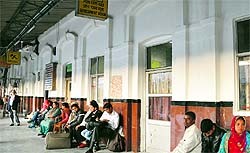 At last, the Northern Railway authorities have put in motion the process for reopening of the refreshment room at platform number one which is lying closed for the past more than 10 months. Putting an end to the issue involving six houses allotted to riot victims, which had become a bone of contention between two parties of victims, the Supreme Court today dismissed the case and ordered the present occupants to vacate the houses by January 1, else face eviction by the district administration. A day after Mayor Harcharan Singh Gohalwaria conducted a surprise check at MC’s Zone D building and found that the water tanks on the top floor were damaged and the area around them was unhygienic, the MC officials got their act together. The district health department is all set to start the cancer survey in Ludhiana district from tomorrow. For this month-long survey, the department has roped in 3,787 volunteers. Members of the State Bank of India Officer's Association (SBIOA) held a demonstration in front of the zonal office of the SBI at Fountain Chowk here today. Deputy Commissioner Rahul Tiwari has appealed to the masses to raise their voice against food adulteration. High drama was witnessed at a marriage palace located on the Chandigarh road, after relatives of the bride detained the groom and his family members for seeking Rs 2 lakh as dowry during the wedding ceremony here this evening. 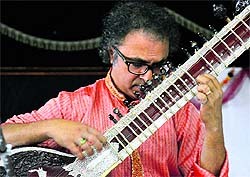 Pandit Shubhendra Rao, renowned composer and sitar maestro, performed in the city today. Rao captivated the music lovers at Delhi Public School, and later at Guru Nanak Khalsa College, Model Town. Kirti Kisan Union launched the "Save Small Farmer" campaign outside the Mini Secretariat here today. In yet another incident of carjacking, four armed assailants kidnapped a banker on gunpoint, and later drove away with his Chevrolet Magnum car leaving him at secluded place near Dehlon area here last night. The students from Guru Ram Rai Public School, Ludhiana, emerged as the overall champions at the two-day Idea Junior Championship League 2012 that concluded at the Guru Nanak Stadium here today. With the arrival of England women's kabaddi team here this evening, the ball has been set rolling for the third Kabaddi World Cup slated to begin tomorrow. The team from Malaysia is expected to arrive around 10pm.